Clashes in the area of the Shomron community of Tapuah West ahead of planned evacuation next week. 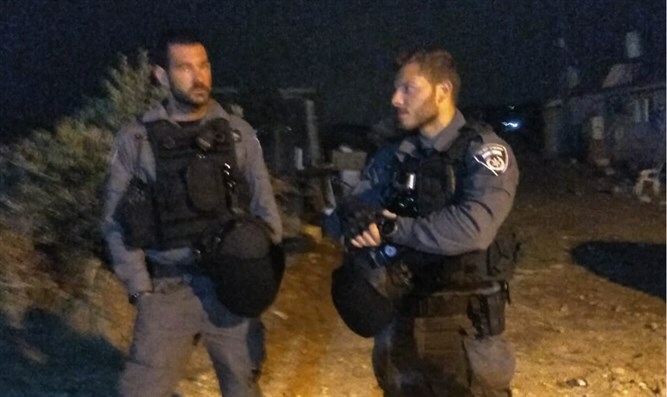 Security forces arrived on Saturday night at the Shomron community of Tapuah West, in preparation for the evacuation of several homes next week. The forces declared a closed military zone around the hill. Security forces are expected to evacuate several buildings that were erected in the area in accordance with a Supreme Court ruling from February of last year. The few families who are to be evicted from their homes will be forced to move their homes to a new location on the hill, a few dozen meters away. The state has presented them with a number of proposals but the residents are disagreeing over how to respond. The leftist organizations that petitioned for the Jewish homes to be demolished initially requested that the entire community, which included 39 buildings, be evacuated. The Supreme Court partially accepted the petition and ordered the demolition of 17 structures built on private land. With regard to 18 other buildings that were built without permits on state land, the state has requested that they be regulated under law and not be demolished. The state is to respond to the Court regarding four additional structures by the beginning of next month. “Most of the structures have been moved outside the area to which the Supreme Court’s ruling relates, and therefore there is no reason for ‘voluntary evacuation.’ The families, some of them families with many children who need a home, have suffered enough in the past year because of the difficult move of being in a state of ‘ahead of an eviction.’ It is inconceivable that a government that calls itself a nationalist government will lend a hand to the continued persecution of the families, who have already invested and relocated the structures in advance,” continued Dagan. “There are tens of thousands of illegal Arab structures in the area, which are not evacuated because of a 'shortage of manpower'. It is sad to see that even when a nationalist government is sitting in Jerusalem, immoral evacuations continue. We must stop once and for all the grave violation of the human rights of the residents of Judea and Samaria," he said. Attorney Itamar Ben-Gvir clarified, "Unfortunately, the residents of the hill do not have alternative homes and some of them will become homeless. The protest is, of course, first and foremost against any evictions. But in this case, unlike Netiv Ha’avot or Amona, the residents are thrown into the street."